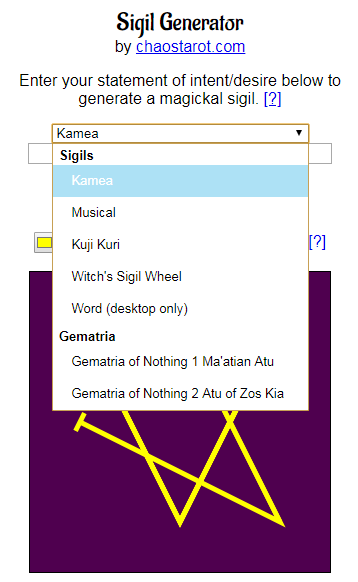 The chaos magick sigil generator allows you to generate sigils using a variety of different methods and setting! Click the button to begin, or scroll down to read about how it works. 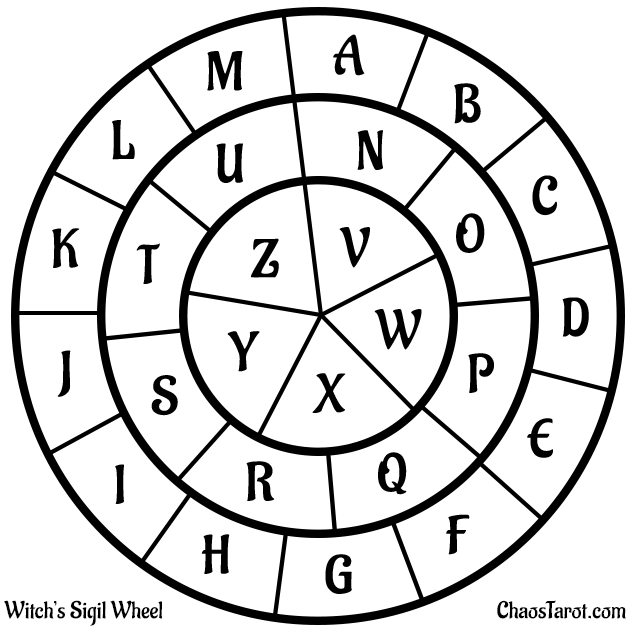 You can read more about the Witch’s Sigil Wheel here. It’s like a magic square, but well, circular. It also has it’s own traditions and quirks. While “show controls” option is on, use the mouse to click on the transform and rotate controls around each letter. 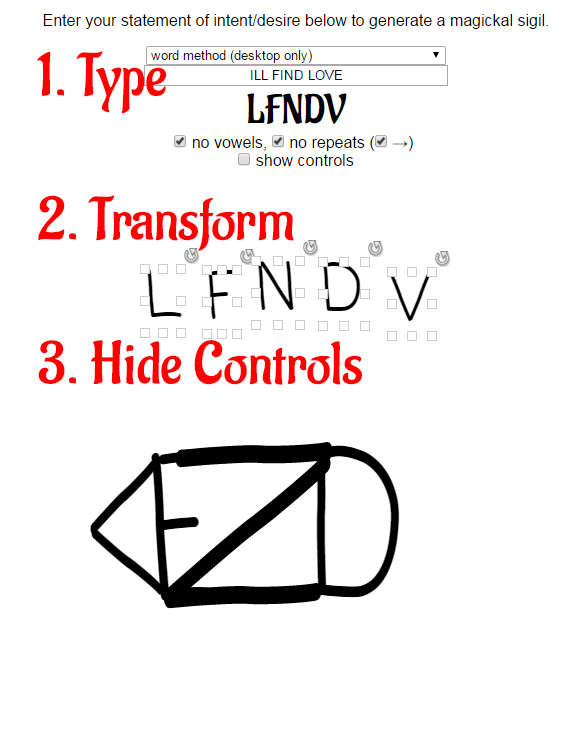 Move them around however you want to create a sigil from the combined letters. Play in whatever cleff you want depending on your instrument. 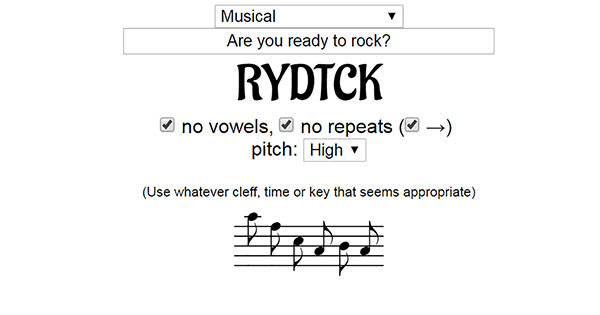 Play the notes in whatever time and key signatures sound the best to your taste. Adjust the length of the note and ad rests to your taste. Charge it however you’d like. You could play it over and over like a mantra, or sneak it into a larger piece of music to get it stuck in people’s heads. If you are seeing something like “=N=L=I=G=H=G=” instead of a musical staff, the embedded webfonts aren’t loading for you. Try a refresh or give it a few more moments before digging deeper into your web browsers capabilities or switching browsers. Read more about Kuji Kuri here. It’s a real thing even though you also see it in Naruto. This will output a sequence of Bikram Yoga postures you can do while meditating similarly to a mantra. 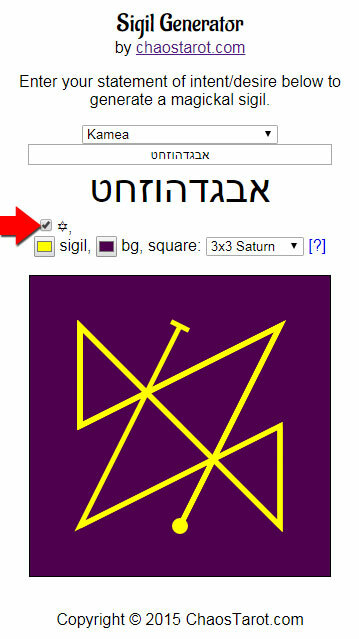 To use the Chaos Magick Sigil Generator using the Gematria just type in your phrase and choose which cipher to use. You’ll get the number and below it the reduction. You can find GoN1 meanings here. More to come. Choose which deck you want to use. At any point after dealing you can also shuffle the remaining cards that are undealt. Shuffling only shuffles the deck you currently have selected. Click “draw” to lay a card down from the deck you have currently selected. You can change decks and continue drawing if you want to use more than one type of deck in a spread. Use the ↑↓ checkbox to decide if you want to view reversed cards or not (determined during shuffle). Click restart to clear the table and order all the decks. You can find The Forty Servants meanings here. You can use the Hz setting to fine tune the speed of the strobe, then just close your eyes, place your phone over your eyelids, and wait for the visions. Alternatively, you can use a VR headset, they are cheap af. Magick Sigils are commonly used in Chaos Magick to bypass the conscious mind and let the subconscious mind do the work without your mind’s natural filters working against you. According to Peter J. Carroll’s Liber Null, they are created using one of 3 methods, the word method, the pictorial method, or the mantrical method. 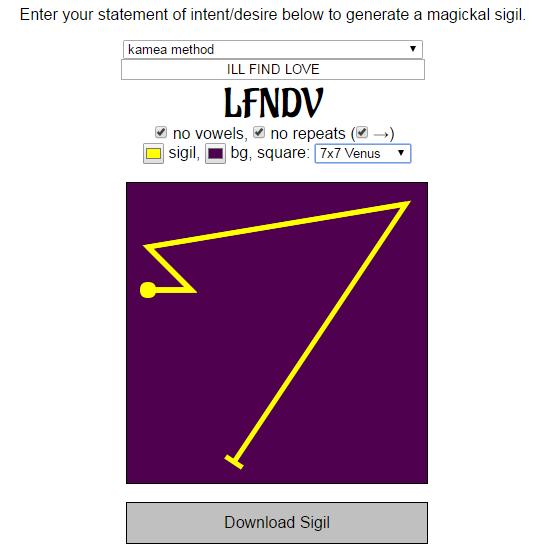 Generating a chaos magic sigil using the pictorial method is freehand so this tool does not help with the pictorial method. You might try MS Paint or Photoshop for that, or a pencil and paper. 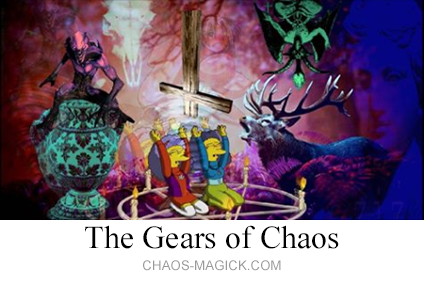 To create a chaos magick sigil using the pictorial method you draw a rough picture of what you want and minimize the elements of the picture until you arrive at a simple symbol. Generating a chaos magick sigil using the word method you will start with a phrase of desire like “I want to win a million dollars” (always stated in the positive, not the negative, because the subconscious mind often ignores words like “not” which can cause you to get the opposite of what you intend). Then you eliminate the letters that appear twice and either arrange them into a symbol. Generating a chaos magick sigil using the mantrical method, you start out just like the word method but arrange the letters into a mantra instead of a symbol. Your phrase is converted into numbers and then traced out on a planetary number square called a kamea. Different planetary kameas are used depending on what you hope to accomplish. This is very interesting. Thank you for simplifying something that seems very hard. I am very thankful for this beautiful chaos sigil maker. I much preferred when the font was like Arial, straighter than the hand written font. Would you please create the option again? I find it much easier to trace from a solid font for the letters. Thanks so much. I am very thankful for this beautiful chaos sigil maker. Is there any significance to a sigil of your full name? Not built-in, but you could give it significance by using it as you wish in rituals etc. do i need to activate the sigil that i made,or it is already activated somehow? Basically i created one with kamea style plus venus planetary. I would like the developer of this software to make me an installation version for off line operation on my computer or even a cellular phone app. This guy just asked me for a version of my code that he could use anywhere, and then when I politely declined he flipped out like it was ridiculous that I shouldn’t hand over all my work to him.